San Diego business leaders called on Congress Tuesday to pass permanent protection for the Dreamers, saying failure to do so would be “disastrous” for the regional economy. “We need the hard working Dreamers. Taking them out of the economy would be disastrous for our regional economy,” said Jerry Sanders, president and CEO of the San Diego Regional Chamber of Commerce. 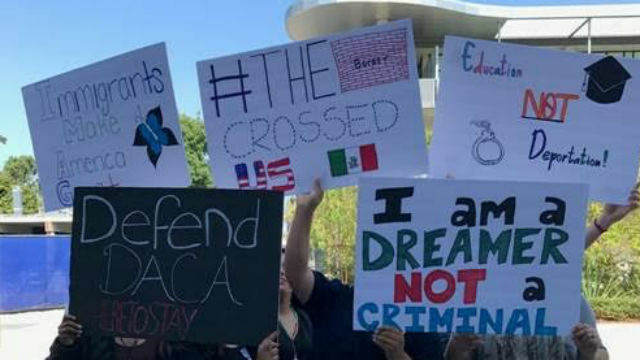 President Trump canceled the Deferred Action for Childhood Arrivals program effective March 5 and a divided Congress has been unable to pass legislation to replace it, with a number of bills failing in the Senate last week. At a press conference on Tuesday, leaders in education, restaurants and tourism said the Dreamers are vital to the San Diego economy. “The local restaurant community urges Congress to pass bi-partisan legislation as soon as possible,” said Chris Duggan of the California Restaurant Association. Business leaders said that recent legal challenges to Trump’s action have created further uncertainty. “I’m really scared for my family. I’m scared for my community,” said Dulce Garcia, an immigration attorney and DACA recipient who has lived in San Diego for 30 years.